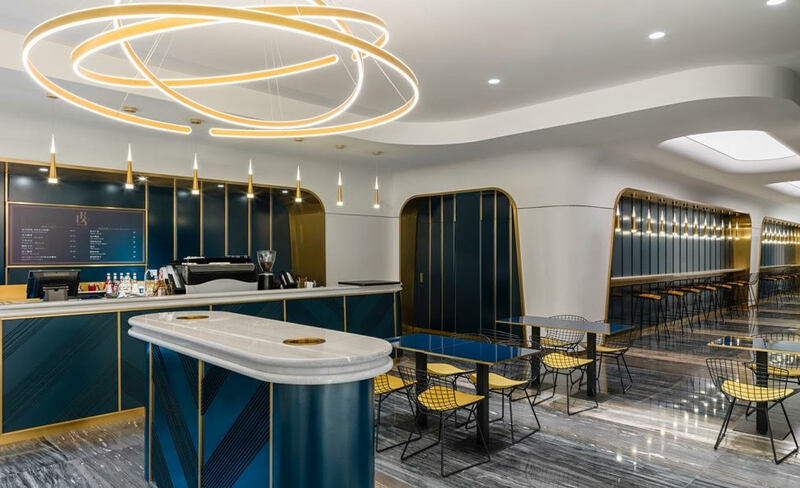 London-based architectural firm Sybarite has a designed a futuristic cinema for high-end Chinese retailer SKP using bold and distinctive branding as well as luxurious materials. The cinema, the first for the retailer, is housed in it’s new 20-storey luxury department store in the ancient Chinese capital of Xi’an. The cinema spans two floors, which are linked with a brutalist, poured-concrete staircase. Each of the seven screens at the SKP Cinema at SKP Xi’an – two double-height Halls, two VIP Halls, a Kids’ Hall, a Theatre Hall and a Love Hall – has a signature geometrical stacking effect across the ceiling and walls similar to that of an armadillo shell. 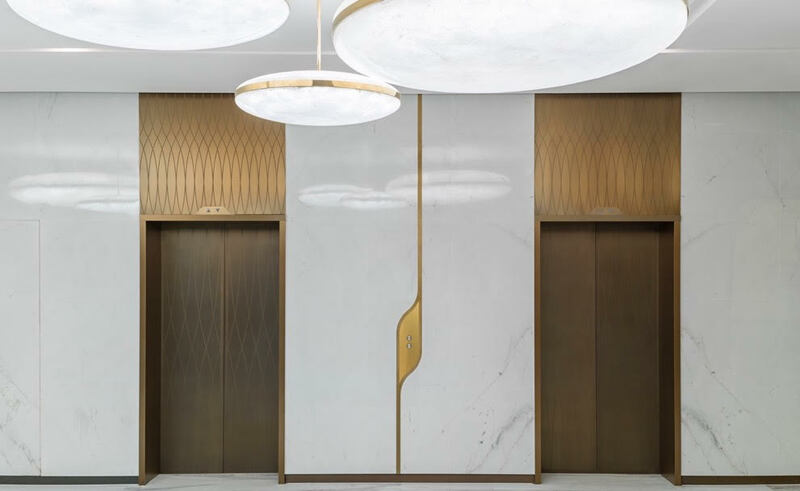 This design highlight connects the ceiling and the walls, with the curvaceous offset also allowing a gap for air-conditioning and subtly diffused lighting. Aside from the multi-hued Kids’ Hall, each screen has its own single colour identity, such as red for the Love Hall, with seats matching the walls. 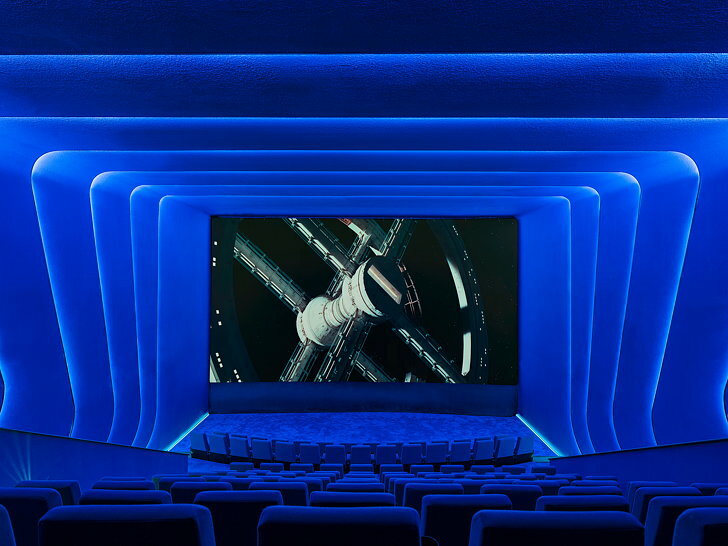 To accommodate celebrities attending screenings, the SKP Cinema also has incorporated a Green Room and VIP event space with a brushed brass cladded bar, made up of serrated semicircles with an oriental black marble top. The communal areas which includes bars, a café and point-of-sale areas – have been designed to encourage cinema-goers to stay for longer, meeting friends and family before and after watching a film. Unrelated to the rest of the design language is the concrete staircase. The modernist architectural detail contrasts with a deep-pile red carpet, with a glass handrail also clashing with the concrete. The staircase is a modern take on old-school Hollywood, transporting celebrities up to screenings on the floor above. 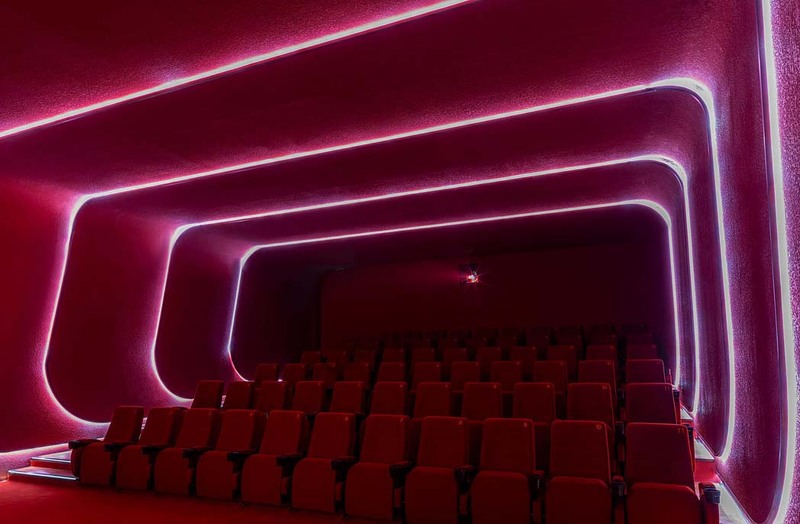 “Sybarite has created a luxurious, contemporary and futuristic design for SKP Cinema, which can standalone and sit harmoniously within SKP stores, while also creating a destination for film premieres and events. The SKP Cinema brand is set to be a leading new entertainment brand across Asia.” says Michael Ferrera, senior director, Store Planning & Design, SKP.